Radha Kund Snan is an important bathing ritual associated with Lord Krishna and Radha in Vrindavan. Radha Kund Snan 2019 date is October 20. In some calendars it is on November 1. The Snan (holy dip) is observed during the midnight on the eighth day of Krishna Paksha of Kartik month as per traditional North Indian Hindu calendar - the day is also known as Bahula Ashtami and Ahoi Ashtami. This sacred pond located in Vrindavan in Braj (Uttar Pradesh) and is associated with the legend of Lord Krishna and Radha. It is widely believed that taking a holy dip in the Radha Kund on the Kartik Krishna Paksha Ashtami will help childless couples in having children. Couples who have problems in conceiving come here and seek blessings of Radharani. The midnight time, Nishita kaal time, is considered the auspicious period to take the holy dip. Those couples who were blessed with children after offering prayers here too take the holy dip and make offerings as part of thanksgiving for the blessing received. Legend has it that Lord Krishna killed Demon Aristasura who appeared in the form of a bull. But Radha was not pleased with this divine act and asked Lord Krishna to bath in the holy rivers and purify the sin of killing a bull before talking with her. To satisfy Radha, Krishna created a pond with his right heel and invited all the holy rivers in the world to fill the bond with their waters. The pond was soon filled with water of all holy rivers and came to be known as Shyam Kund. 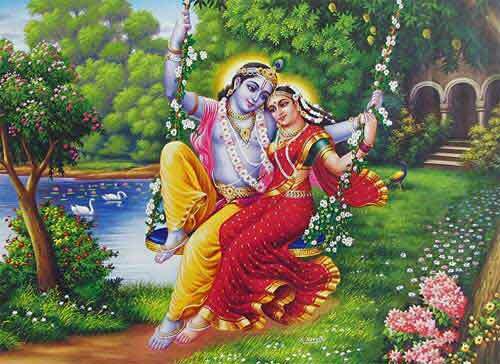 Krishna took bath in the pond and Radha was satisfied. An enraged Radha saw a large fissure created by the hoof of Demon Aristasura near Shyam Kund. Radha and her friends started digging it with broken bangles. Soon a huge pond was created. But there was no water to fill the pond created by Radha and her friends. So Krishna offered to give water from Shyam Kund. But Radha did not agree. The holy rivers then appeared before Sri Krishna and offered to fill the newly created pond by Radha. Sri Krishna asked the holy rivers to take the permission of Radha. Who then agreed and thus Radhakund was formed during the midnight of Ashtami day during waning phase of moon in Kartik Month. Sri Krishna then took bath in the Radhakund and declared that whoever takes a dip in the holy pond on the day will be able to experience the same Bhakti that Radha has for Him. Thousands of devotees arrive at Radha Kund on the day to take a holy dip.